The Maruti Suzuki Zen was considered to be one of the most engaging cars back in the day. Powered by a 1-litre engine made out of aluminium, it managed to push out a decent 60 horsepower. It may not sound like much now but was just enough back when the car was launched. For the 2004 model year, this car got a new body, also known as the tiger shape in our market and was sold until 2006 when the production was discontinued. The go-kart like handling characteristics and relatively low centre of gravity of the car makes this a treat to drive, even today. Maybe why, we still see many enthusiasts trying to get one of these machines. 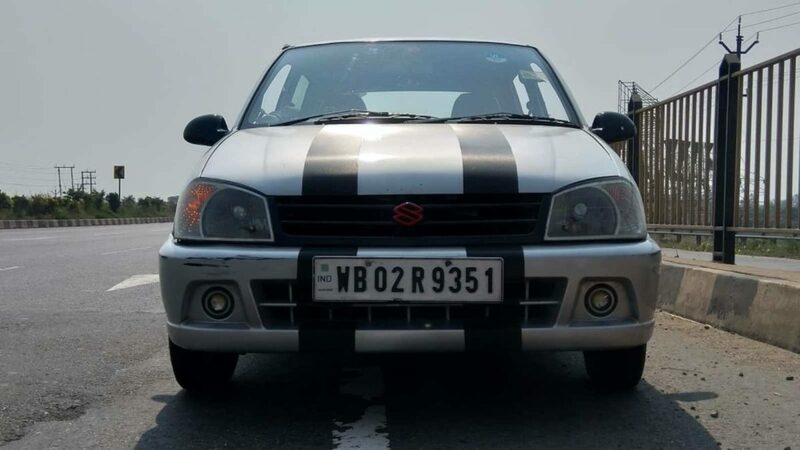 Here is one such example of a Maruti Zen, which has said goodbye to the good old 1-litre motor and has received some serious updates, transforming into a tiger which is ready to hunt down its prey. Under the Bonnet of this car rests a 1.6-litre motor from the old Baleno sedan. This engine was known to produce as much as 95 hp and 131 Nm from the factory, however, the figures would be different in the case of this Zen. It comes with a custom air intake and a custom free flow exhaust which help the motor breathe better. Moreover, the ported and polished cylinder head, intake ports and stand-alone ECU give the power a serious boost. We do not have exact power figures but the owner claims that the car can now sprint till 100 kmph from a standstill in about 9 seconds and will go till a claimed top speed of 220 kmph! Running on high octane fuel, it already is quite evident how fast the car can go but the Zen was not endowed with the best brakes. The stock brakes would have been as useful as a fork while having soup. The owner has installed brake pads and rotors from world-renowned brake manufacturer, Brembo. The upgraded brakes along with the grippy Yokohama 185/60R13 rubber makes sure that this Zen can also stop as fast as it can go. Below are some images of this sleeper for you to see, do have a look.